Kyoto is a landlocked city, but there are a number of seaports that you can access quite easily by public transport. 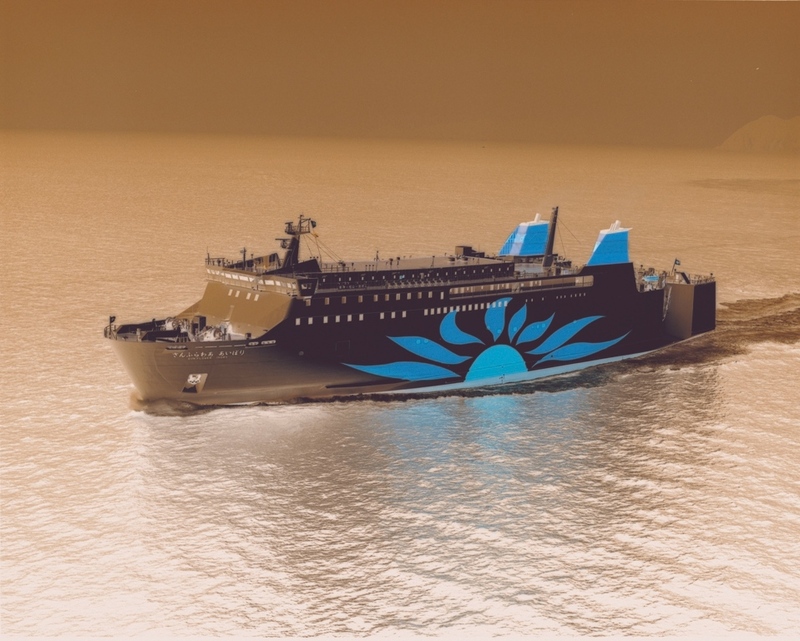 In this article Jun Kitayama introduces the best ferry services from the seaports near Kyoto. In Japan, ferries tend to have a poor image and most people assume they are uncomfortable and tiring. Tell someone, “I’m taking a ferry” and the likely response is, “Don’t do it!” Of course you don’t need to follow such advice. Most Japanese ferries these days are quite modern (with all the older boats being sold off to Greece and the Philippines) and traveling by ferry can be very pleasant indeed. Also, big ferries don’t roll so much on light waves, so you don’t need to worry about getting seasick. However, because of this enduring negative image, a lot of ferry routes are short on passengers. Ferries really only get booked up over the New Year and Obon holiday periods, and at those times the fares go up, too. During other periods, though, there are always empty seats and you can easily buy a ticket on the day you travel. The ferry companies survive, though, because they can still make a profit carrying cargo. There are many classes of accommodation which you can choose from according to your budget. These range from the “carpet seats” to suites. Carpet seats are open rooms where you lie quite literally on the carpet, and they aren’t so comfortable. Spending a little more on a bed is recommended. It won’t cost you that much more, and when you consider the money you are saving on a hotel, then booking a private room is a smart choice too. Berths and private rooms have electrical outlets, but carpet seats often don’t. Some ferries have outlets in public areas that anyone can use. Ferries with Wi-Fi access are still quite rare, but when you are in sight of land you should be able to use your mobile phone. Onboard restaurants are no more expensive than those on land, but if you really want to cut costs you can stock up on provisions before you embark. Many ferry terminals are far from urban centers. There are buses to get you to the ports easily enough, but remember to do your shopping before you get on the bus. Aside from smaller vessels, ferries have public baths (separated by gender), where you can bathe while enjoying an ocean view. Of course you can take a dip as many times as you like and it is absolutely free. Click on the menu icon on the top left of the map to make the menu slide out. You’ll see three different headings – Lines, Bridges and Terminals. The Lines denote the ferry routes; the Terminals denote the ports of call; and the Bridges are the major bridges that the ferries pass under along their route. There are four major sea routes that can easily be accessed from Kyoto. These are the Hokkaido Sea Route, the Seto Inland Sea Route, the Southern Kyushu & Okinawa Sea Route, and the Pacific Sea Route. Let’s take a look at the ferry companies serving these routes. This ferry departs from Nagoya at 19.00 and arrives in Sendai at 16.40 the following day, and Tomakomai in Hokkaido at 11.00 the day after that. 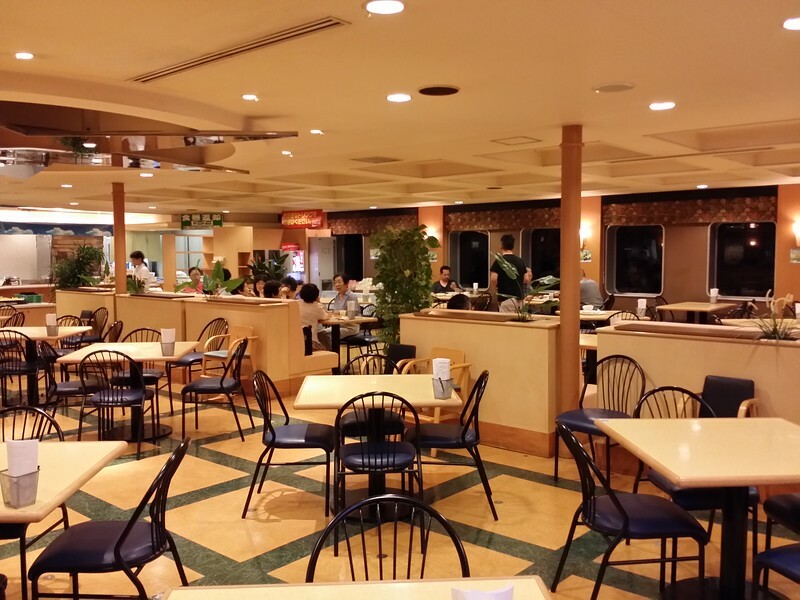 This ship has the best facilities of any ferry in Japan and excellent service. Many tourist groups take this ferry, so it can get quite lively. In Sendai you can go on shore for about two hours which gives you just enough time to shop for souvenirs or enjoy the local specialty dish: grilled beef tongue. It is surprisingly cheap, and if you book it 28 days in advance – even cheaper. One ferry departs from Maizuru in Kyoto Prefecture at 00.30 and arrives at Otaru in Hokkaido at 20.45. Another departs from Tsuruga in Fukui Prefecture at 1.00 and arrives at Tomakomai East Port in Hokkaido at 20.30. There is also a weekly route that goes from Tsuruga at 10.00 via Niigata (22.30), and Akita (15.50 the following day), and on to Tomakomai East Port at 17.20. The fare is the same as for the direct ferry. It’s a route that will appeal to those who prefer to take a more leisurely trip. The direct ferry from Tsuruga has outdoor “rotenburo” style baths. These big elegant ferries aren’t flashy but the service is good, and they are built to an extremely high standard. There are very few passengers so it is usually very quiet. Because the departure time is late, they will let passengers on early so they can get settled in. This is the shortest course to Hokkaido, with a same-day arrival, and the ferry flies along at 50km per hour. The experience of sailing at full speed ahead is quite exhilarating. Because of the speed, passengers who wish to go outside are restricted to the rear deck for their own safety. For most of the journey you won’t see any land, just the sea, and your phone will have no reception. Your destinations have a remote Asian flavor. Otaru is an old port city with long rows of stone warehouses. Tomakomai East Port is also located in a wild area on the city outskirts, so you might feel like you have arrived in Siberia. You should be prepared for the fact that just a little bad weather can cause delays. You won’t get bored watching the constantly changing scenery of the Seto Inland Sea with its many islands, bridges, and countless boats sailing back and forth. However, domestic ferries largely travel by night. The sweeping turns of a big ferry as it moves forward is a lot of fun. Waves are fairly gentle on the Inland Sea so the ferry won’t roll around too much. However, when there is a typhoon the ferry will be automatically cancelled. This company operates two services. The ferry departs from Kobe at 18.30 and arrives at Shin-Moji in Fukuoka (Kyushu) the following day at 7.00. Passengers can remain on board until 8.00. The ferry departs from Izumiotsu in Osaka at 17.30 and arrives at Shin-Moji the following day at 6.00. Passengers can remain on board until 7.30. This ferry also has an outdoor rotenburo bath on board. One ferry departs from Osaka Nanko Port at 17.00 and arrives at Shin-Moji the following day at 5.30. There is a 30% discount for internet reservations on this route. The other ferry departs from Osaka Nanko Port at 19.50 and arrives at Shin-Moji the following day at 8.30. Hankyu and Meimon Taiyo are competing for passengers, so their service is of a high standard, fares are low, and the onboard restaurants have a good reputation. The Meimon Taiyo departure at 17.00 is a real bargain if you book it online. If you want to travel to Kyushu cheaply, this is your best choice. There is a free shuttle bus from Shin-Moji to the city of Kokura. One ferry departs from Osaka Nanko Port at 19.05 and arrives at Beppu Kanko Port (Kyushu) at 6.55 the next day. The other ferry departs from Kobe at 19.00 and arrives at Oita (Kyushu) at 6.20 the next day. The sea route to Beppu has 100 years of history. Fares are high. However, there is an extremely cheap three-day round-trip Night Cruise plan with two nights’ accommodation on board the ferry. This bargain plan may be suitable for younger travelers who can enjoy the boat trip to the Beppu hot springs without having to pay for a hotel. 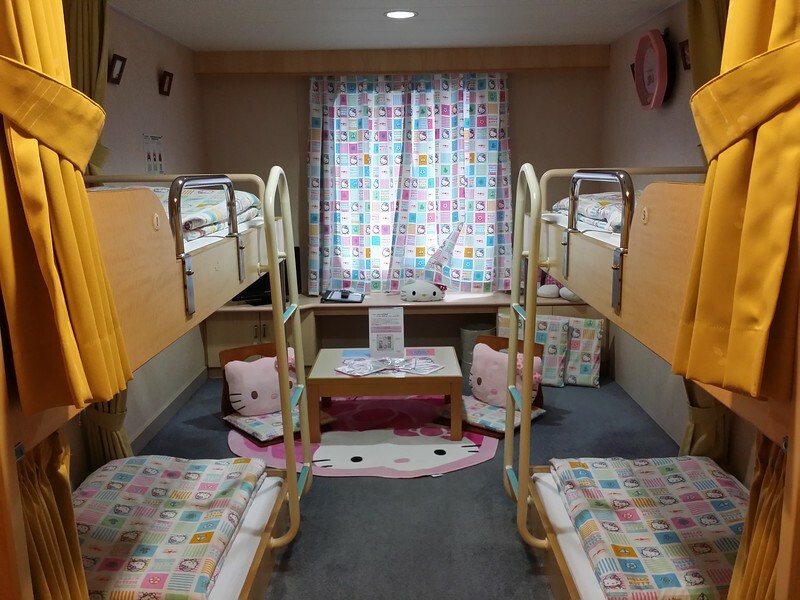 Round trip tickets with sleeping berths start from 12,340 yen. One ferry leaves Osaka Nanko at 22.00 and arrives at Toyo in Ehime (Shikoku) at 6.00 the next day. This service has a great reputation. The shuttle bus from Toyo to Matsuyama takes 1 hour and 30 minutes. The other ferry departs from Kobe at 1.10 and arrives at Niihama East Port (Shikoku) at 8.10. Not many regular passengers take this service so the cabins and meals are both reasonably priced and of a very high standard. This company runs four services a day from Kobe to Takamatsu in Kagawa Prefecture (Shikoku). The trip takes 4 hours and 15 minutes. There is also a night ferry and a service that goes via Shodoshima. The ferry is small and a one-way ticket is just 1,990 yen. You can get a great view of the Akashi Kaikyo Bridge that links Honshu to Awaji Island. On board the boat you can enjoy Kagawa Pefecture’s famous Sanuki Udon noodles. This ferry runs from Osaka at 15.30 and arrives at Busan in Korea at 10.00 the following day. There are three services a week. This ferry is old, but it has a great range of services. This ferry also has Wi-Fi. Depending on the season you can sometimes see the Great Seto Bridge. The ferry passes through the Kammon Straits between the islands of Honshu and Kyushu. These straits are so narrow that they seem like a river. Even though it is a night passage it is still very impressive. This weekly ferry leaves Osaka at 12.00 and arrives at Shanghai at around 12.00 two days later. This company runs weekly ferries from Kobe and Osaka at 11.30 that arrive at Shanghai at 12.00 two days later. Both services for Shanghai have an early embarkation time, so you can really enjoy viewing the scenery of the Seto Inland Sea. Most ferry services to southern Kyushu take a course through the Pacific Ocean but if there is a typhoon they will be diverted through the Seto Inland Sea. This ferry departs from Osaka Nanko Port at 17.55 and arrives at Shibushi in Kagoshima (Kyushu) at 8.55 the next day. From Shibushi to the center of Kagoshima City there is a shuttle bus that takes 2 hours. If passengers book the bus in advance they can ride it for free. This ferry departs from Kobe at 19.10 and arrives at Miyazaki (Kyushu) at 8.40 the following day. This services has a better reputation than that of Ferry Sunflower to Shibushi. 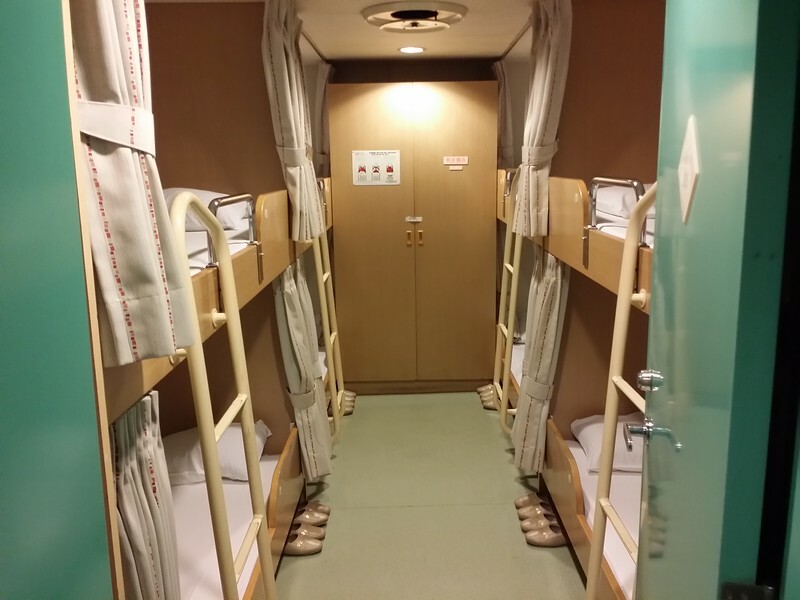 2nd class berths are just 7,000 yen if you book them 28 days in advance. Taking connecting ferry services from Kyoto to Tokyo is surprisingly realistic. For example the following route takes exactly 24 hours at a cost of 14,440 yen. This ferry runs between Wakayama and Tokushima. There are 8 services a day that take 2 hours and 5 minutes. There is also a night ferry. This is Japan’s only remaining connecting service between a railway and ferry. At Wakayamako Station the ferry connects directly with the Nankai Railway. If you use the special “Skip 2000” discount ticket, you can travel by rail from Osaka’s Namba Station effectively for free, and travel to Tokushima for just 2,000 yen. This ferry departs from Shin-Moji before 19.00, stopping at Tokushima at 11.30 and arriving at Tokyo at 5.40 the following day. The return ferry departs from Tokyo before 19.30, stopping at Tokushima at 14.20 and arriving at Shin-Moji at 5.40 the following day. To get to Shin-Moji the car ferry from Osaka is convenient, the worthwhile part of this trip is the journey from Tokushima to Tokyo. Recently all four ferry boats have been rebuilt. The Tokushima terminal has also moved and ferry transfers have become much smoother. A great way to explore Japan by ferry is with the new Japan Ferry Pass 21 ticket that allows you to ride six of the ferries described above during a 21-day period. For full details, check the Japan Ferry Pass 21 website and also see my in-depth guide to travelling on Japanese ferries using a Japan Ferry Pass. You may also enjoy my detailed trip report of taking the ferry from Kyoto to Hokkaido.